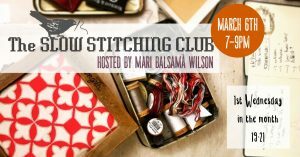 The SLOW STITCHING CLUB is an embroidery club based in Stroud, and run by Mari Balsama Wilson at Atelier. A creative place for embroidery lovers to meet, share skills and ideas. You can join us to work on new projects or pick up old ones. £ 7 per session or pay as you feel. Free for Members. Money is going to Atelier towards new events and initiatives.